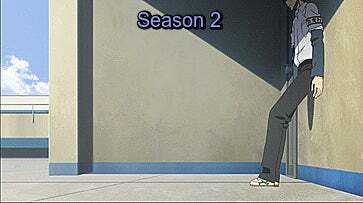 Minor naming gripes aside, I've enjoyed my time with the second season. All 24 minutes of it that I have access to. Which is great, because I admit, I was a little nervous going in. 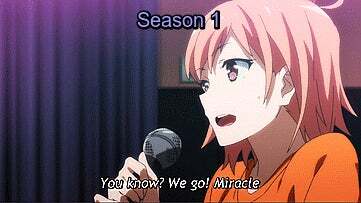 While this show certainly needed a second season, as the first season did not end in any kind of satisfying fashion... I had heard news of a change in animation. Typically these animation changes are iffy at best, and I haven't had the best experiences with them in the past. My worries were for naught. Just seeing this made me very happy. Notice the MUCH more realistic motion. 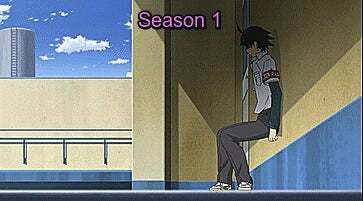 Trying to slide down the wall like Hachiman does in the scene from season 1 is almost impossible, and the season 2 version allows you to see exactly how defeated he feels at that moment. There are also some very noticeable stylistic differences. The scene, and show in general, has a lot less contrast in it's colors, and notably thinner outlines on the characters. This serves to make the characters feel like they are more a part of the environment, rather than popping out. 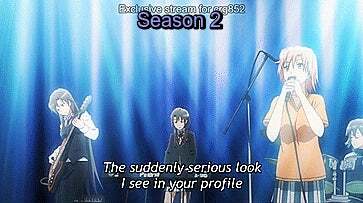 This is not a strictly good or bad thing, but I personally think the new style fits the themes of loneliness and isolationism in SNAFU better than the eye popping contrast of season 1. One of the most interesting things I found about this whole situation is the identities of the studios behind these different styles. Season 1 was produced by Brain's Base, which is a studio responsible for several very popular shows, such as Spice and Wolf, Princess Jellyfish, and Baccano! On the other hand, the new producer, studio Feel, really do not have many big name titles under their belt. In fact it seems that most of their work consists of in-between animation. This makes the dichotomy between these two styles even more surprising to me. I assume that the difference in quality is largely because of a bigger budget for Studio Feel's season, because the series already has an established fanbase. However, their stylistic differences were mostly just design choices, and I respect them for making the shift to what they believed would fit the show better. Because at least for me, it works. Tell me which style you prefer! I love talking about sound design, but I can't fill EVERY post with only music related stuff, hard as I try. So expect a mixed bag of content from me. Happy streaming!